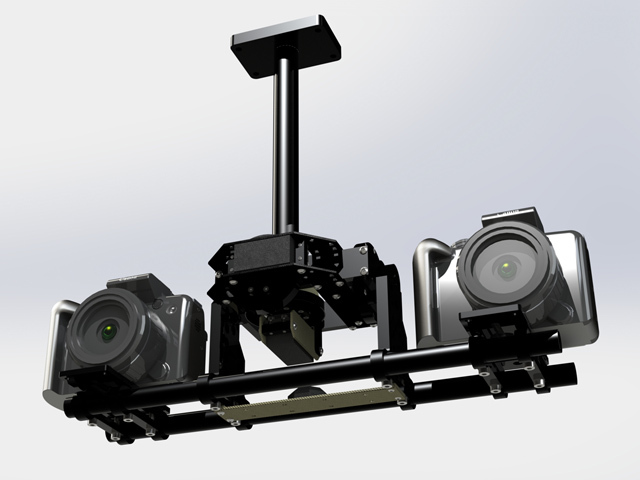 Smaller, lighter and more accurate internal camera gimbal. The design of this stabilizer is drastically different from all current popular models. It doesn't have a large frame around the camera limiting the length of the camera and lens, doesn't use large bicycle type handlebars and has no requirement for a special stand. However, the main difference is in the new type of servo drives that it uses. All stabilizers are intended for isolating the camera from vibrations of the unstable base, but some vibrations still go through. We compare angular velocities on the unstable base with those on the stabilized platform. The vibration of the stabilized platform is 1000 times weaker than the vibration of the unstable base. This is nearly 5 times better than all the popular direct-drive stabilizers. Similarly to other stabilizers, the POINTER requires a position controller that monitors diversions from the set direction and corrects them. However, prior to making a correction, our stabilizer reduces the dependence between the unstable and stabilized parts. The F-Servo drives allow the unstable base to sway freely, while the stabilized part remains fixed. F-Servo not only creates torque, but also reacts to the force applied from outside. This is why the needed corrections end up being much smaller. Vibrations from the unstable base are passed to the stabilized platform through rotating joints. 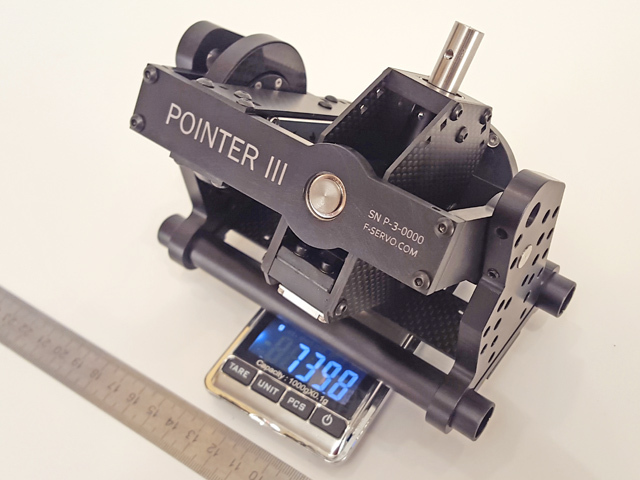 In the POINTER stabilizer, the axial block is compact, rigid and lightweight. The inertial moment of the stabilized part is increased via a counterweight and a longer arm of force. All these measures reduce the amount of unwanted vibrations that reach the camera. Standard 15mm profiles with a 60mm distance are used for mounting the equipment. Fixtures from different manufacturers and of different configurations can be used. 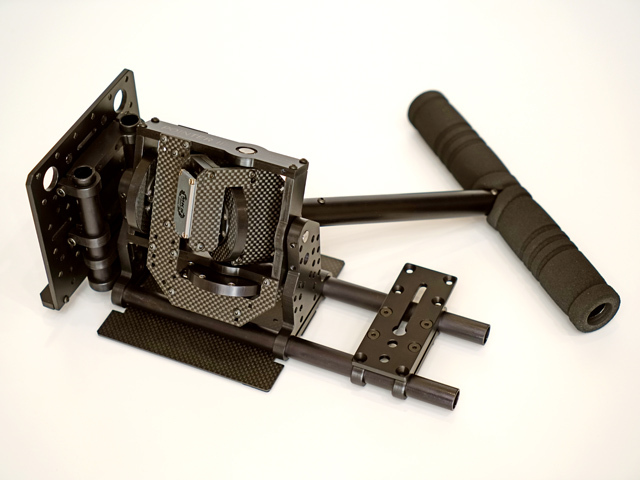 Pointer-III is the optimal solution for stereoscopic aerial filming. When the stereo base is widened, the 3D effect is preserved even for distant objects. A battery, display or any other type of payload is used as a counterweight. Camera weight to counterweight ratio - 2/1 (approximate, recommended). Load must be balanced in three dimensions. 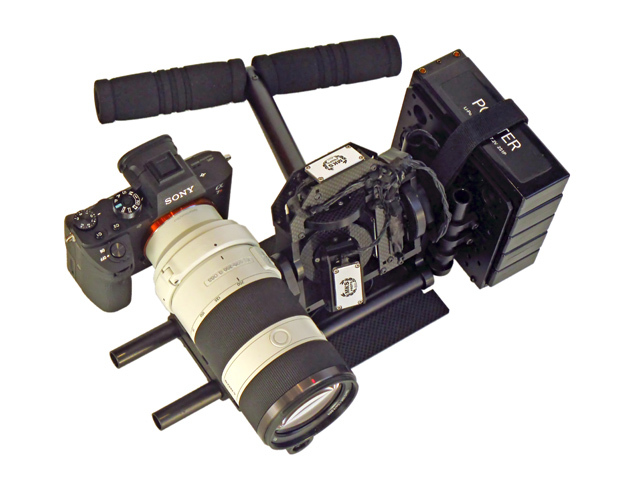 Pointer-III gimbal, Sony A7R camera, 70-200mm lens, three batteries Li-Po 2S 6A/h. Total weigh 3,94kg , 48 hours of operation on a single charge.